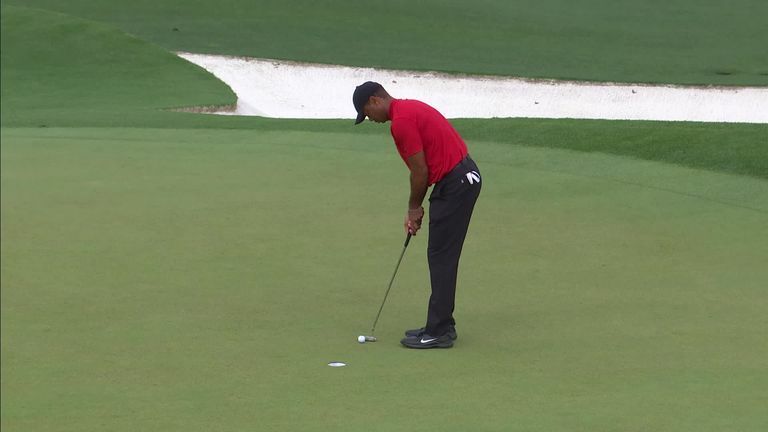 Woods then holed from eight feet for birdie at the third, but he gave it straight back when he came up short at the 240-yard fourth, while Molinari enjoyed the luxury of two cast-iron pars which restored his two-shot advantage, and the Italian nailed another nerveless par putt on the fifth green as Woods three-jabbed to bogey the hole for the fourth straight day - a first in his career. Molinari's metronomic radar suddenly deserted him after pars at 10 and 11, finding water at 12, then again at 15 to end his hopes. Patrick Cantlay, Schauffele, and Johnson all enjoyed spells in the lead; Bubba Watson, Rickie Fowler, and Justin Thomas all threatened, with Thomas emulating Bryson DeChambeau's ace at 16. Woods' task over the last two holes was made a little easier when, up ahead, neither Johnson, Schauffele, or Koepka were able to find the birdies on 18 they needed to apply the appropriate pressure, and the iconic red shirt was cleared for a procession to the finish line. Molinari, meanwhile, was left to count the cost of his two double-bogeys after the turn - the first when he produced almost a carbon-copy of Jordan Spieth's first attempt to reach the 12th green in 2016, and he was unable to get up and down after dropping short and left of Rae's Creek. Johnson looked out of the running with six to play before he suddenly reeled off four birdies in five holes to post a 68 and the initial clubhouse target of 12 under, while Koepka's bid for a fourth major also came up a shot short after a rollercoaster inward run in which he found water at the 12th before bouncing back with an eagle at the next. Another birdie followed at 15, but he could not do better than par over the last three holes and had to be content with a 70, while Schauffele's run of five birdies in seven holes around the turn swept him to the top of the leaderboard on 12 under, but his failure to birdie the long 15th would ultimately prove pivotal.